When living in Germany until September 1999, I never had the chance to follow Bob around for half a tour like other Germans I know. My record had been five concerts during one tour and by moving to Ireland I did not improve my chances to ever top that. So I thought. But things have changed. Intending to go to six shows in September 2000, my wife and I ended up seeing ten: Dublin (both Vicar Street and The Point), Aberdeen, Glasgow, Newcastle, Birmingham, Sheffield, Cardiff and Portsmouth (both shows). In the summer of 2001 we saw another Irish concert in Kilkenny, and in May 2002 we had the pleasure to see another eight shows in Britain: Brighton, Bournemouth, Cardiff, Newcastle, Manchester, Birmingham and London (both shows). During the European tour in the fall 2003 we intended to see of course both Irish shows, in Dublin, and in Millstreet (here in County Cork). The Millstreet show unfortunately was cancelled due to "viral laryngitis", but I kept the page on the site, as it features some nice pics I took. Also we did visit our native Germany before, and did see two fine Bob Dylan shows, in Frankfurt and in Düsseldorf. 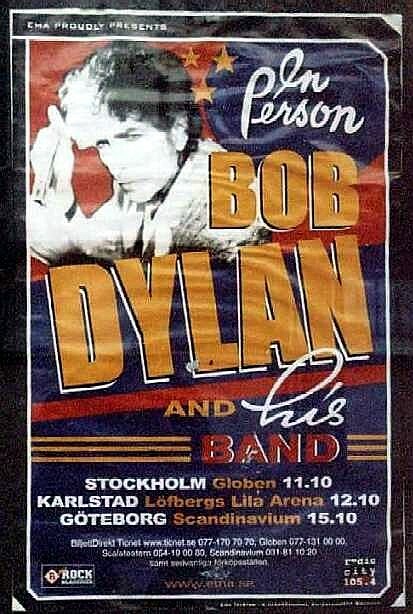 But even before that we did celebrate my 40th birthday in style, by spending a long October weekend in Sweden, where we also saw two Bob Dylan concerts, in Stockholm and in Karlstad. In the summer of 2004 we went up to Northern Ireland to see our first Belfast concert, and of course straight to Galway, to witness Bob Dylan's first show in the west of Ireland. During the European tour in the fall of 2005 we attended six shows. At first my wife and I flew to the mainland to see the shows in Rotterdam, in Oberhausen, in Wetzlar (which is located 40 miles down the road from where we used to live in Germany), and in Erfurt. And then, back in Ireland, we saw both concerts in Dublin, which were the last ones of the touring year. During the summer of 2006 we attented three Bob Dylan shows as Bob Dylan finally performed here in Cork on 25 June at "The Marquee". Another Irish show, which we saw as well, was added for the day before the Cork gig. It took place at Kilkenny's Nowlan Park, where Bob Dylan had already played in the summer of 2001. One week after Cork we saw another concert, in Gelsenkirchen, Germany, where Bob Dylan performed in a modern Amphitheater. As Dylan did not perform in Ireland in 2007, my wife and I revisited our native Germany again, and went to see two concerts, in Düsseldorf and in Frankfurt, in the same venues where we witnessed two great shows already back in the fall of 2003. And as no concert in Ireland or Germany were scheduled for the European summer tour of 2008, my wife and flew to the southern part of Spain in July, and saw three of the Dylan shows, in Jaén, Jérez, and Mérida. On May 5th and 6th 2009 we saw Bob Dylan twice in Dublin, which were his first appearances in Ireland since his perfomance here in Cork in 2006. In July 2010, nine days after the concert in Limerick I attended, our son was born, so my wife has not been attending any shows with me since then. In 2011 I have witnessed first the glorious show here in Cork in June, and then the show in Dublin in October. Since Dylan did not perform in Ireland in 2012, I attended two shows on the European mainland, in Bad Mergentheim, Germany (where I saw him already in 1991), and in Salzburg, Austria. As the European autumn tour of 2013 did not include any Irish dates as well, I chose to see another few shows on the continent, at first both shows in Stockholm (at the end of two beautiful sunny sightseeing days immediately following my 50th birthday), where I already saw Dylan once before, on my 40th birthday ten years earlier; and then (in between visiting family in Germany) also the two shows in Hamburg as well as the one in Düsseldorf. The European tour of 2014 however started here in Ireland in June, so I attended both the concert here in Cork and the one in Dublin the day after. Dylan's third appearance in Cork was the first show in the 74th year of his life, as well as my 74th Bob Dylan concert. As all the 59 European Bob Dylan concerts in 2015 (of which 19 took place in the summer, and another 40 in the fall) have been outside of the Emerald Isle, I have attended the last show of the summer tour in Lörrach in July; and also the first two London shows in October, as well as the fine concert in Düsseldorf in November. With the European spring tour of 2017 ending in Dublin, I had intended to only see that one Irish show. But when three concerts at the Palladium in London were added to the tour schedule later on, I chose to attend also the second one of these three shows. As the European spring tour of 2018 did not come near these Irish shores, I decided to see the two most eastern concerts of the tour, in Brno and in Wien, two cities I had never been to before. The European spring tour of 2019 also did not include an Irish date, so I travelled to Prague in April to attend the three fine concerts at the Lucerna, which was the first time for me to see three consecutive shows at the same venue. The European summer tour of 2019 will end in Kilkenny (with a huge open air concert in a hurling stadium, with Neil Young also on the bill); and I have my ticket already for this gig in July. The little DYLAN image by Milton Glaser on each concert page links directly to the concert next page. A final page lists all the songs I have seen Bob Dylan perform, together with performance dates linked to the relevant concert pages.